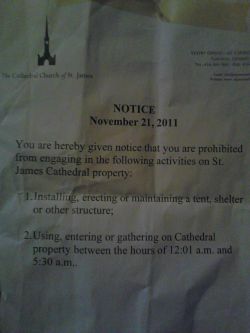 The sound of drums compete with church bells, as Occupy Toronto heads for an expected eviction showdown at midnight. The month-old encampment lost a key legal battle today, as an Ontario Superior Court judge issued a 54-page decision dismissing an injunction filed last week by several occupiers. Already, there are (unconfirmed) reports of police in garages and vehicles around St. James Park, and what may well be the camp's final General Assembly is underway at the gazebo. Uncertainty had surrounded the injunction, which was mounted on constitutional grounds and did not address the question of ownership (St. James Park is jointly owned by the City of Toronto and the adjacent St. James Cathedral). In his decision, however, Judge Brown explicitly stated that the eviction exclusively concerned lands owned by the city, and not the part of the occupation which resides on church property. In an about-face, the church, which previously stated it would defer to the courts on any decision to evict occupiers, issued its own eviction notice this afternoon to occupiers of the portion of St. James Park which resides on church property. It is unclear whether or not clergy will call the police to enforce their own order if demonstrators do not leave by a midnight deadline. Around 5pm, a thousand-strong labour march arrived to loud cheers, reinforcing demonstrators in response to a broad callout to resist the eviction. Although there are no plans to obey the eviction notice, Occupy Toronto and its supporters hope to avoid a repeat of the police violence seen during the G20 last year. Affinity groups have begun to form, and occupiers are categorizing themselves according to their willingness to be arrested (green, yellow and red). Additional supporters are expected, building on a week of energy that culminated in a large demonstration on Saturday. Occupy Toronto is the latest in a string of encampments that has faced a state crackdown. 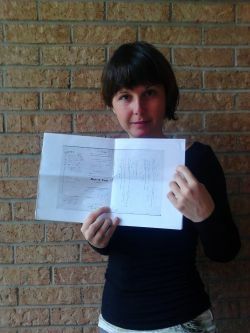 The growing list of evicted Canadian occupations include those in Regina, Halifax, Saskatoon and London, with eviction orders also issued against camps in Vancouver, Montreal and Edmonton. In the U.S., New York's Occupy Wall Street (which was evicted last week) is one of a large number of occupations which appear to have been the target of a coordinated federal law enforcement attack. In spite of the reported police presence around St. James Park, the timing of the eviction remains unclear. Ninety minutes after the Superior Court ruling, Mayor Rob Ford stated that he expected demonstrators to comply with the original eviction order 'as soon as possible,' with City Manager Joe Panachetti pushing for an eviction well before midnight. Update: The night passed without incident. As of 6pm Tuesday, there still has been no raid on Occupy Toronto. We are the 99% We will be heard. Submitted by Parker East (non vérifié) on mar, 11/22/2011 - 04:01. Here is one of my contributions to the movement.... so far. Pass it along.